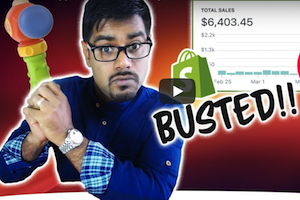 With all of the noise surrounding Shopify Dropshipping, there’s a lot of disinformation and unnecessary confusion when it comes to Facebook Advertising. First of all, if you’re new to Dropshipping and are looking to build and drive traffic to your first Shopify store, Check Out Bizathon3. Between Rito and Myself we have 20 years digital marketing experience and counting. And in those two decades we’ve observed many trends come and go. Some were surprising and others obvious. And there are always new trends, myths, and secrets to account for. Today we’re covering one myth in particular, that involves Facebook Advertising. Whatever the case was, this myth was so widespread, that we were hesitant to even test our own assets with it. The myth was simple in concept. You never turn off (or pause) a winning campaign, because it will never perform as well once it’s restarted. Simple and believable enough as Facebook has been known to implement some strange tactics. But how could they not want our winning campaigns to continue their success? The better our ads do, the more money we spend. This was troubling and affecting how we managed existing ads. So we decided to put it to the test. If you recall from our February 2018 Income Report we were forced to pause nearly all of our winning campaigns due to the Chinese New Year (our suppliers took extended leave). We new this was going to test the theory whether we liked it or not. In fact, several of our winning campaigns were paused up to four weeks. On March 7th, most of our suppliers returned from their holiday and we resumed several of our winning campaigns. By March 10th, we were back up to $2,000 per day in sales. As you can see, this myth is definitely busted. Our ads are performing just as well as they were prior to being paused. And by continuing to use our winning product strategy we’ll be able to further scale and maximize our profits. So the next time you hear somebody saying you can’t pause winning (converting) campaigns without losing out on future conversions, you can refer them to this post. Or simply be suspicious of the information that person is sharing. That’ll do it for Episode 28 – Great work! P.P.S. Click here for Episode 29!